PARIS --- Now that Italian magistrates have dismissed the final charges against two former CEOs of AgustaWestland for lack of evidence, it is worth looking at how the accusations were formed, and what they rested on. The Italian prosecution’s case rested on the same allegations as the ongoing investigations in India: that AgustaWestland had bribed the then Chief of Staff of the Indian Air Force to lower the required maximum altitude for the VVIP helicopters. The original tender required the helicopter to fly at altitudes up to 6,000 meters, which AgustaWestland’s AW101 could not do, but by the time it won the contract the altitude requirement had been lowered to 4,500 meters. This allowed the AW101 to win the competition, and the anti-AW lobby immediately seized on this to allege corruption, to inflame India’s notoriously trigger-happy media and to encourage MPs to question the government on this issue. Despite all the publicity, four years later no trace of any improper payment, nor indeed of any impropriety at all, has been found, in India or elsewhere. This finally led the Court of Busto Arsizio, in Italy, to acquit the two accused CEOs of corruption charges in October 2014, since in the judges’ words “no offence was committed,” and finally to clear them of all remaining ancillary charges earlier this month. Charges against both AW and Finmeccanica had been dropped in the spring of 2014. Prosecutors are appealing the acquittal, while the two CEOs are appealing their conviction on lesser charges, but these are now minor sidelines, which the prosecution will probably lose and the two CEOs probably win. Even though no money was found to be paid by the Italian contractor, India’s Central Bureau of Investigation and its Enforcement Directorate are still, in separate investigations, looking for bribes paid to Indian officials, so far unsuccessfully. The bribery allegations first surfaced in India, and were initially ignored by the government. But they were taken up, repeated and circulated by certain Members of Parliament who no doubt saw them as a useful weapon in the upcoming general election, and as a possible way to reopen bidding on the contract to benefit other manufacturers. Stoked very effectively, the allegations took on a life of their own, leading to a press campaign in Italy fueled by pacifist and disarmament networks, and ultimately to the opening of an investigation by magistrates in Naples. This was subsequently transferred to Busto Arsizio, near Milan, by the Supreme Court. Not everyone is impressed by the investigative zeal shown by Italian magistrates, nor by the self-righteousness of the Indian Defence Minister, who single-handedly took the decision to first block payments to AgustaWestland, then to cancel the contract, and finally to sue for payment of the surety and performance bonds that the company had placed in escrow, on the basis of unproven allegations. In doing so, Antony ignored a fundamental legal and moral principle: that the accused is innocent until proven guilty. This is unconscionable behavior for a cabinet minister in “the world’s greatest democracy,” and can only be explained by motives other that a constitutional duty to his mission. The reality is that Antony, as the upcoming general election neared, even wanted to put AgustaWestland and Finmeccanica, its corporate parent, on the government’s blacklist, until he was blocked by the Solicitor-General. 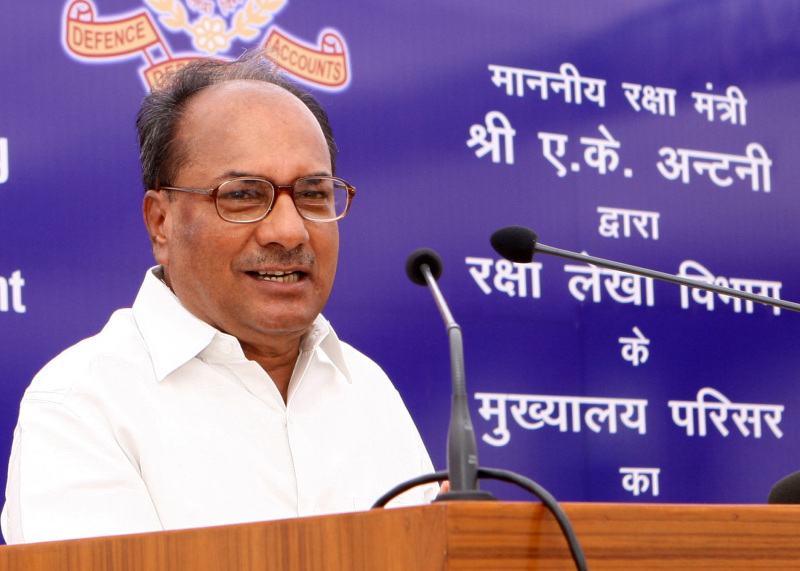 At the time, Antony was less interested in running his department than in burnishing his credentials as India’s “Mr. Clean” in anticipation for a run for higher office. In fact, he was so wary of any whiff of corruption that he simply stopped awarding equipment contracts, thereby severely impeding the armed forces modernization. This is one of the reasons why talks about India’s Rafale purchase dragged on inconclusively in 2012 and 2013. Yet, even as he pilloried his Italian supplier for alleged corruption, Antony’s own staff had produced a document that, had anyone bothered to read it – notably Italian magistrates -- would have indisputably cleared AW by removing the motive for corruption. So, at that date, the defense ministry had not found any impropriety. 3. On November 19, 2003 a meeting was taken by Principal Secretary to PM on this subject. In the meeting, Principal Secretary observed that his main concern was that the framing of the mandatory requirements has led us effectively into a single vendor situation. It was also noted that PM and President have rarely made visits to places involving flying at an altitude beyond 4500 meters. In the meeting it was decided to make the mandatory requirement for operational altitude 4500 meters. The higher flying ceiling of 6000 meters, and a cabinet height of 1.8 meters could be made desirable operational requirements. It was observed that with these revisions, several helicopters which otherwise met all requirements, but had been rejected due to the altitude restriction, would now come into the reckoning. 17. The procurement case was, thus, progressed in accordance with the established procurement procedure in a transparent manner with all stages of procurement being followed meticulously. No ambiguity is possible: the decision to lower the altitude requirement was official and above-board. It was taken during a meeting chaired by the Prime Minister’s Principal Secretary, was followed up in writing with the Air Force Chief of Staff, was reviewed by the then-Defence Secretary. Subsequently, the “Operational Requirements were deliberated at length” for 18 months by the authorities involved before becoming effective, and included in the final Request For Proposals. Once this document was made public, it was impossible for anyone to give credence to claims that the Air Force Chief of Staff was bribed to secretly lower the altitude. Yet, these claims were made, and although still unsubstantiated they eventually led to investigations and a trial in Italy, to several (continuing) investigations in India, during which more than a dozen people had their assets seized and bank accounts frozen. In Italy, two former AW chief executives lost their jobs, and their reputations, and AW itself lost a €566 million contract, as well as €228 million of its €278 million performance bonds, which dented its cash position and that of Finmeccanica. All of this for no other reason than an Indian minister’s overwhelming preoccupation with his political future. And, to add insult to injury, he and Italian prosecutors will be the only characters in this sorry story to escape unscathed. In August 1999, the IAF which is responsible for carrying out VVIP communication task, proposed the replacement of Mi-8 VIP helicopters due to severe operational constraints, such as, inability of Mi-8 to operate at night and in adverse weather, inability to operate safely at places in elevation beyond 2000 meters etc. IAF felt the need for the replacement of Mi-8 helicopters as they were completing their total technical life. 14. Contract Negotiation Committee (CNC) was constituted and it carried out its discussions with the vendor between 19 September 2008 and 21 January, 2009. While the CNC was progressing its discussions, Air HQ recommended inclusion of Traffic Collision Avoidance System (TCAS-II) and Enhanced Ground Proximity Warning System (EGPWS) for all 12 helicopters and SPG/PMO recommended inclusion of Medevac System for 8 VVIP helicopters. These additional equipment were considered to be essential for safe and effective operation of the helicopter in VVIP transportation role. SPG also agreed to these requirements. The CNC, thereafter, recommended conclusion of the contract at a negotiated price of EURO 556.262 million. 22. MoD also noted the report in the ‘Hindu’ of 28.2.2012 that, quoting Finmeccanica, states that its subsidiary AgustaWestland is not involved in “any irregularity in the deal”. 23. Subsequently, MoD received more than one communication from M/s AgustaWestland confirming that the statements in the press are “completely unfounded and have been issued with malicious intent” and that “no commissions whatsoever were paid” in the case. 28. MEA’s response again was that the matter had been taken up with the Italian side and the position conveyed for the need for ‘reliable information’, for “news reports alone could not be the basis for the Ministry of Defence to make any preliminary determination”. 31. Earlier, in connection with the letter received from one Mr. Edmund Allen of Ganton Limited, USA, MoD had written on 19.4.12 to CBI and Enforcement Directorate for necessary action, as Abhishek Verma and others were also being named in various media reports in connection with several defence deals. Later, Enforcement Directorate informed MoD in July 2012 that they were enquiring into the allegations. Click here for the full document on the Indian government website.